Paper and Threads: Happy New Year - and Best Wishes for a Great 2016! Happy New Year - and Best Wishes for a Great 2016! 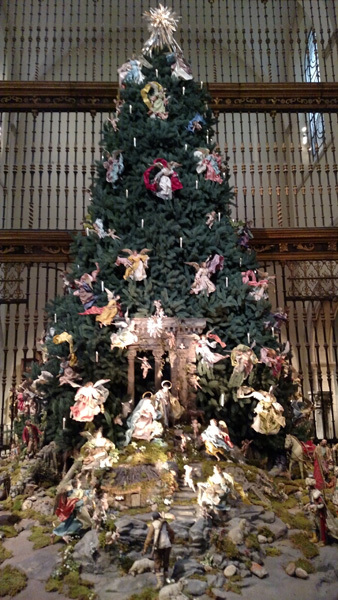 I'm not ready for the Christmas Holiday to be over until I enjoy the Rockefeller Center Christmas Tree and the Metropolitan Museum of Art Tree - filled with gorgeous Italian ceramic and silk angels. On Wednesday Pat and I immersed ourselves in art at the Met and I wanted to include this photo. I draw one of the angels each year, but haven't had any time to paint her yet. 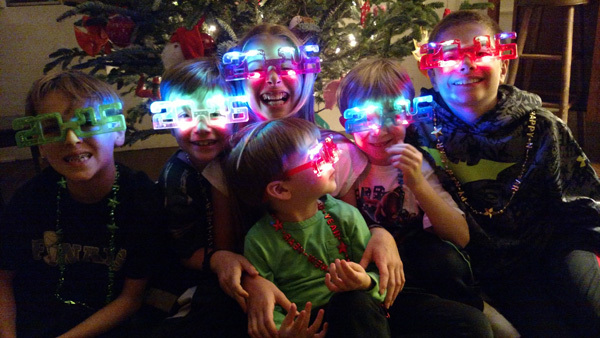 On Thursday, New Years Eve, we had our 8th "Cousins New Years Eve Party." We started this tradition when we had 4 grandchildren in NYC, and there have been changes as our youngest grandchildren join us. Last year we even had Annabelle - our DC grandchild here. We have a great time with them and the sleepover allows their parents to enjoy the evening and get a good night's sleep. This year everyone except Charlie, the 3 year old, made it to Midnight to welcome 2016 - and then fell asleep to the sound of fireworks over Central Park. Having the appropriate new lighted glasses is essential! I was led to your page through FB Artist Journal Workshop group. I would be interested in the PDF your created on your journal cover pencil holder. Thanks...If I make one I'll post it on AJW if that is okay. Hi, Shirley...You are so talented in so many different areas! ....so creative! I would love the pattern for the journal cover pencil holder. I want to also make a brush holder that rolls up for travel. ....am going to the fabric store tomorrow to see what might be fun fabric to use.